Several years ago, on a Saturday right before Halloween, the members of the newly planted church that I pastored decided to do some outreach in our community. I wrote a pamphlet on the history of Halloween, its origin, and its practices. I ended with a stern appeal, telling people they should not celebrate Satan’s holiday, that kids should not dress up, and all the same things you have probably heard for years. As I shared the messages and “love notes” from the community with my wife, Joanne, she made me think as she often does. She said, “Halloween is the only time of the year when hundreds of our neighbors come to our home and knock on our door and we have never opened that door for them.” As we spoke, I realized how true her statement was. Our practice at home had always been to turn off the light, go upstairs, and hear our bell ring over 100 times that night, without answering. Finally, as we thought long and hard about what to do, we came to a conclusion, which has become a family tradition. I will share it with you. You don’t have to do it, this is just what we do. Days before Halloween, we purchase a few bags of the healthier candy and order a whole bunch of little Christian bags, toys, mini-Bibles for kids, Bible puzzles, bouncy balls, little airplanes, and a whole lot of other little toys. These bags and toys have beautiful Christian messages of hope for kids, written all over them: “Jesus loves You”, “God made you Special”, “Jesus forgives You”, “Obey your Father and Your Mother”, and “Smile: God loves You”. On Halloween morning, we stuff the bags with some candy and two or three little toys and a mini-Bible per bag. We separate the bags for older kids and for younger ones with appropriate content for each. As the trick or treat time approaches, we turn on the lights inside and outside the house and we wait for our neighbors to come and knock. As they knock, we open the door with our best smiles (Joanne has an awesome smile and so do Jose III and Joel) and we compliment them on some of their costumes and give out our bags filled with messages of hope and love. We tell them, “God loves you,” “God has great plans for your life,” and most reply with a “thanks” or “thank you”. They look inside their bags with excitement and run to tell their friends, “They are giving awesome goody bags in that house…toys, stickers, books, and everything.” Each time we do this, our home becomes the most visited spot in the neighborhood for the night. Little kids and teens love it and so do their parents. “You're here to be light, bringing out the God-colors in the world. God is not a secret to be kept. We're going public with this, as public as a city on a hill. If I make you light-bearers, you don't think I'm going to hide you under a bucket, do you? I'm putting you on a light stand. Now that I've put you there on a hilltop, on a light stand—shine! Keep open house; be generous with your lives. By opening up to others, you'll prompt people to open up with God, this generous Father in heaven.” (Matthew 5:14-16/ The Message, Paraphrase Bible). God did not put you in your neighborhood to fight Halloween and its evil practices. You can take time to do that if you like, perhaps you will have better results than we did with our church plant years ago. 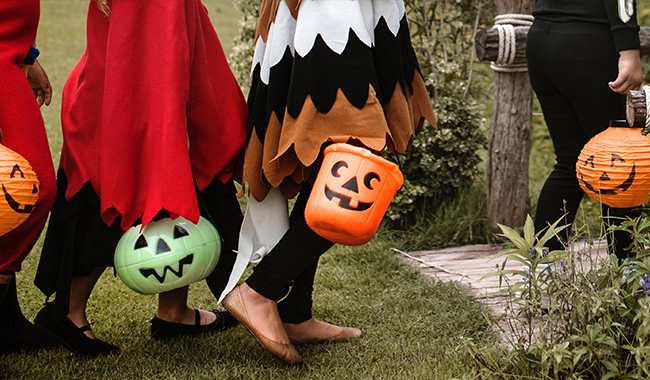 It is likely that many in your community may already know most arguments against Halloween, but God placed you there to share His love, compassion, and hope and the day of Halloween is not an exception. You don’t have to hang skeletons on your front tree and porch or decorate your front yard with fake tombs. We don’t celebrate death, we celebrate life. You don’t have to light up carved pumpkins through your windows or dress like Dracula. You don’t even have to take your kids trick or treating if you find this tradition offensive. You don’t have to participate in any Satanic practices on this day, you know those are not good so please, by God’s grace, don’t do it. But one thing I would like to suggest, just keep your light on, open your house, and send your neighborhood kids and their parents whom you hardly see and speak to back to their homes with a big smile, some love, compassion, lots of hope… oh, and maybe, if you are able to, throw in something sweet! Dark chocolate is actually healthy! Perhaps, this is the day God will use to help you begin a new friendship with someone who needs Jesus and you!